Nybro Golv has been active since the start in 1972. 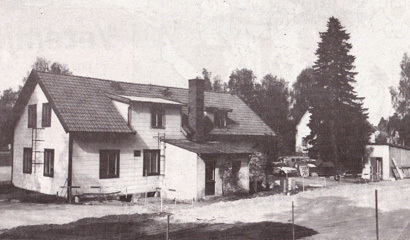 Back then the store was located at Storgatan 95 (se picture). 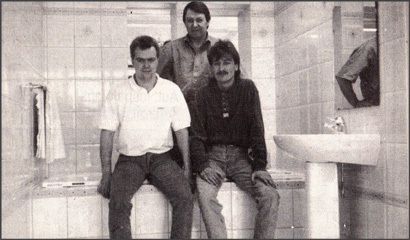 In the beginning Nybro Golv sold floors and wall plastic for both wet rooms and dry spaces. Nybro Golv also sold a small part of kitchen tiles, but the number one seller back then was the carpet. In 1975 Nybro Golv started a cooperation with Kährs, who quickly became the biggest deliverer for Nybro Golv, and they still are. In 1976 Nybro Golv moved together with another local company in the painting-business, to new built facilities at Södra Industrigatan 11. They increased from former 280m² to a new, fresh looking shop around 700m². Since 1991 Nybro Golv is owned and controlled by Karl-Erik Engdahl and his two sons Christer and Mikael Engdahl, after Roland Hansen and Rune Ståhl - two of the three founders in 1972, finished their careers. In 2003, the last one of the founders, Karl-Erik Engdahl, retired and from that day Nybro Golv is controlled by Christer and Mikael Engdahl. Nybro Floor offers a large and well-stocked shop of 625m ² and a warehouse for fast delivery, also of 625m². In the shop you find very nice quality products from the floor- and building businesses, such as Kährs, Tarkett, Forbo, DuoBad, Ballingslöv, Supergres, Novoceram and Konradssons Kakel. Come visit us and tell us about your renovation plans, anything from a wall rail to a full renovation. We are happy to help you with good advice and tips to make your ideas come true. For now we have 14 employees. We have ten skilled and well educated floor layers, tilers and carpenters. Our floor layers are certified in GVK. They quickly and nicely mount the fine products that you pick in our shop with our decorating skilled sellers. Vår välsorterade butik. Klicka för större bild!